This Business Loop I-55 shield stands along eastbound Fifth Street after the Lincoln Parkway in Lincoln, Illinois. Photo taken 05/06/10. 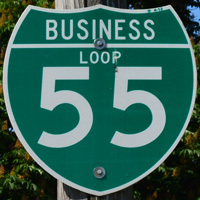 Interstate 55 has six active business loops in Missouri and Illinois. Louisiana, Mississippi, Tennessee and Arkansas do not post Interstate business routes. The 5.75 mile route of Business Loop I-55 through Madrid overlays U.S. 61 & 62 east from Interstate 55. The route combines with U.S. 61 & 62 east from Exit 44 and Howardville to run along the west side of the New Madrid residential area. Mott and Mill Streets stem east from the business loop to the city center as the trio of routes turn northward to rejoin I-55 at Exit 49.
Business Loop I-55 through Cape Girardeau and Jackson could be considered two separate routes. The 15.70 mile alignment arcs east through Cape Girardeau from Exit 93 along side U.S. 61 (Kingshighway) to a busy retail area centered around the intersection with William Street (Route K). Missouri 34 combines with Kingshighway north from Missouri 74, as the three routes turn westward onto a divided highway and cross both Interstate 55 and the Jackson city line. Following Jackson Boulevard west from Exit 99, Business Loop I-55, U.S. 61 & MO 34 constitute a five-lane boulevard northwest to MO 25 (Hope Street). There U.S. 61 and BL I-55 turn north through Downtown, navigating along Hope, Washington and High Streets to northern reaches of the city. Business Loop I-55 reduces to two lanes on the return to I-55 at Exit 105. The Jackson portion of this business route was approved by AASHTO on April 9, 1994.
Business Loop I-55 joins U.S. 67 and U.S. 61 (Truman Boulevard) north as they loop east from Exit 174 through the cities of Festus and Crystal City. Commercial Boulevard extends the three routes north to the city of Herculaneum, where Business Loop I-55 separates for McNutt Street (Herculaneum Spur) west to Exit 178. The 5.1 mile loop is poorly signed, with shields posted at Veterans Boulevard, but the route otherwise signed solely as U.S. 61 & 67. Furthermore the route is not inventoried on the MoDOT HP Map application. The nearly 14 mile route of Business Loop I-55 through Springfield replaced U.S. 66 and U.S. 66 Business northward from Exit 97 to Exit 105. Following 6th Street, Business Loop I-55 splits from I-55 north via a left-hand exit as part of the exchange with Interstate 72 west to Jacksonville. 6th Street proceeds north from there through the village of Southern View and south Springfield as a commercial arterial. A one-way couplet then separates traffic with northbound using 6th and Myrtle Streets and southbound using Spruce and 5th Streets. 9th Street leads Business Loop I-55 north with two-way traffic to Downtown, seven blocks east of the Illinois State Capitol. 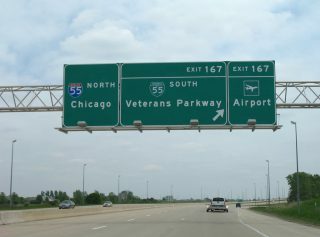 Progressing northward, the route transitions from North 9th Street to Peoria Road ahead of the Illinois State Fair Grounds and Veterans Parkway (IL 29). Business Loop I-55 overtakes Veterans Parkway from IL 29 to join with the Historic U.S. 66 Bypass route ahead of the Sangamon River and village of Sherman. 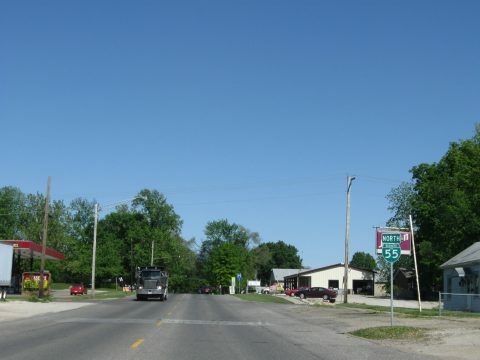 Sherman Boulevard bisects the community northeast to Interstate 55, which directly upgraded old U.S. 66 northward to Williamsville. This business route serves Lincoln via portions of Historic U.S. 66 between Exits 123 and 133. 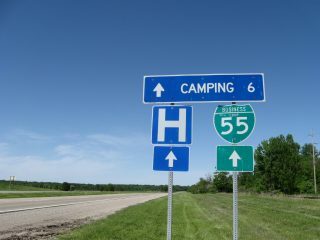 The 8.6 mile route stems east from I-55 along Lincoln Parkway to combine with Historic U.S. 66 north through Railsplitter State Park. The business loop turns east along 5th Street while Lincoln Parkway encircles the city as a former Bypass of U.S. 66. 5th Street bisects residential areas east to Clinton and Logan Streets outside Downtown. Logan Street angles the route northeast to a five-block overlap with Illinois 10 & 121 at Keokuk Street. The trio separate southeast at Kickapoo Street, with Business Loop I-55 resuming a northward route to Lincoln Parkway and Interstate 55.
Business Loop I-55 follows Veterans Parkway from the south split of Interstates 55 and 74 at Exit 157 to Exit 167 at Pipeline Road. 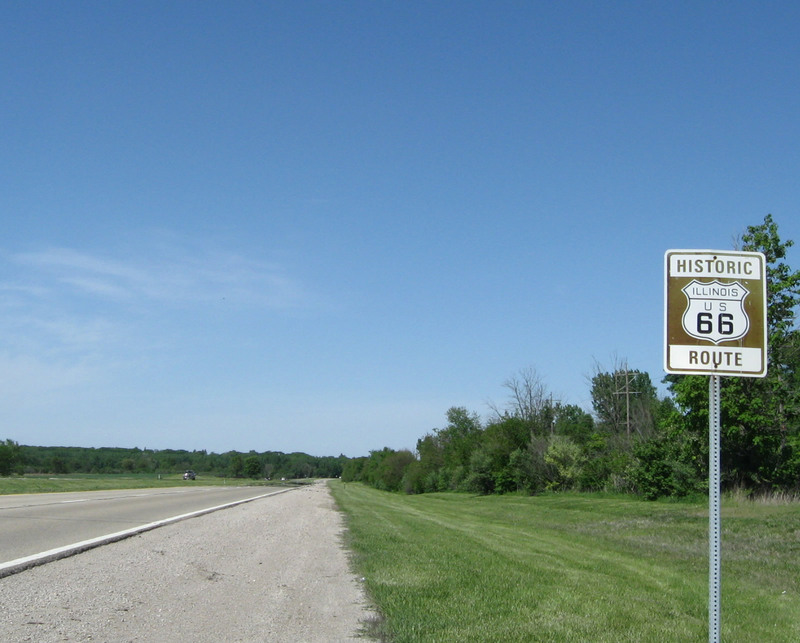 Veterans Parkway represents a 1950s bypass of Bloomington and Normal for U.S. 66. While bypassing Downtown to the south and east, the 9.9 mile route provides access to all motorist services (gas, food, and lodging). Nearby Business U.S. 51 follows Center Street and Main Street through downtown Bloomington and Normal. Diagrammatic sign posted ahead of the south split of Interstates 55 and 72 in Springfield. 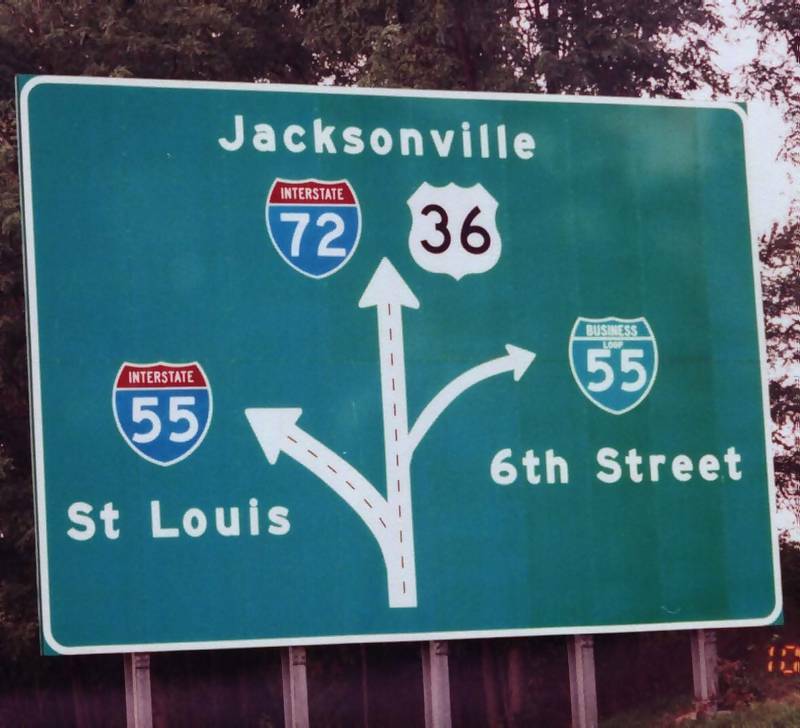 Return access to Business Loop I-55 (6th Street) departs as I-72 & U.S. 36 branch west to Jacksonville. Photo taken by Stephen Summers (10/00). This shield for appears after Lincoln Parkway intersects Historic U.S. 66 north from Fogarty, Illinois. Photo taken 05/06/10. Business Loop I-55 in Lincoln travels mostly along Lincoln Parkway between Exits 123 and 133, but it deviates from the parkway along one of three former alignments of U.S. 66 through Lincoln. 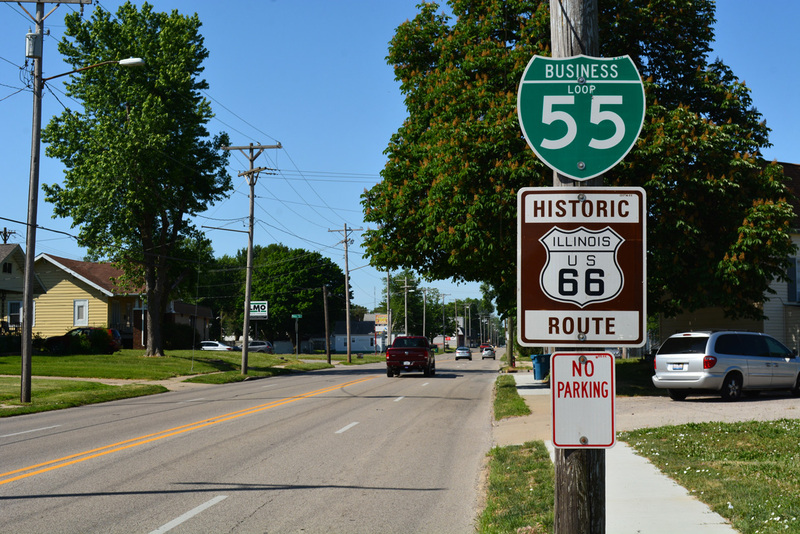 Historic U.S. 66 is signed along with Business Loop I-55 as it travels through Lincoln. Photo taken 05/06/10. Interstate 55 northbound at the return of Business Loop I-55 (Veterans Parkway) from Bloomington-Normal. Photo taken 05/24/08. Veterans Parkway forms an at-grade bypass along the eastern side of Bloomington between the I-55 & 74 merge and Interstate 55, four miles east from the southern terminus of Interstate 39. Photo taken 05/24/08.